The basketball court for a typical school or recreational facility can be one of the most challenging facilities to design. In many cases, the courts are used for more than just basketball. Typically, gymnasiums and recreational facilities will need to accommodate a multitude of other sports, including: volleyball, wrestling, futsal, cheerleading, dance, or any additional activities or classes that cannot practice outdoors or on their field. Furthermore, gyms and basketball courts at many schools also house school assemblies, graduations and pep rallies. At Play On Courts, we understand these challenges and work with you to specify a surface and design that will work best for your needs and your budget. 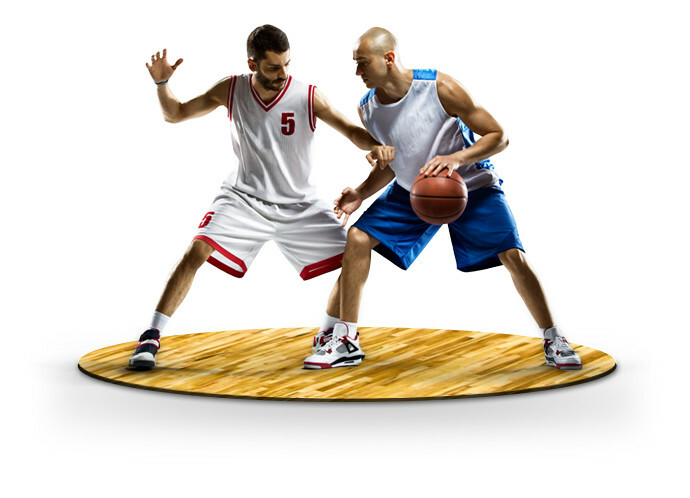 By and large, the most popular surfacing option for new basketball courts is hardwood flooring. 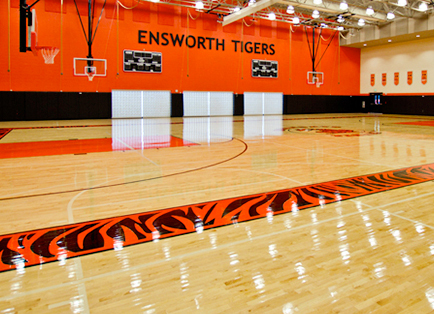 This is the traditional surface for basketball courts as it provides the optimal surface for competitive play. At Play On Courts we provide an extensive range of Connor wood surfaces for a variety of needs. 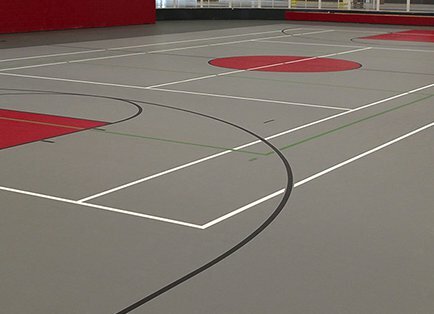 Often referred to as rubber flooring, synthetic basketball court flooring is typically a seamless poured-in-place polyurethane surface that is specified for multi-use facilities. It is an ideal surface schools gyms and other fitness and recreational facilities as it is extremely durable, yet possesses excellent shock absorbent qualities and produces excellent ball response. Plus, it is very easy to clean and inexpensive to maintain. 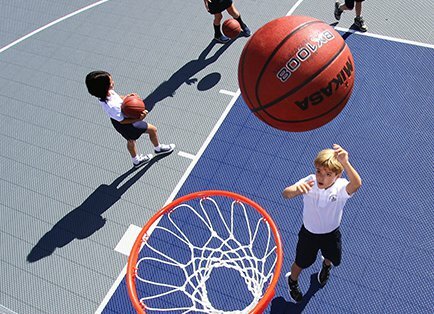 VersaCourt Court Tile is the ideal solution for outdoor basketball courts. When compared to traditional concrete or asphalt playing surfaces, courts made from these shock absorbing plastic tiles tend to be safer and more forgiving on joints and the lower back. The tile's open grid design eliminates puddles and allows courts to drain and dry quickly. Plus they look great and are resistant to cracking, unlike concrete or asphalt.